One of the biggest things that keeps me from polishing my nails is the smell. From the minute you open that bottle, strong smells infiltrate your nose and permeate the air in the room. That smell lingers like cooked fish in a 1 bedroom apartment. Am I right!?! I mean seriously, walk into any nail salon and from the minute you open the door, yikes! Recently my 11 y/o daughter has become obsessed, with her nails. If you have a preteen daughter, you know the struggle. She watches nail videos on YouTube and wants ALL THE COLORS and ALL THE DESIGNS! This mama isn’t comfortable with what’s lurking in these shiny, colorful bottles so I thought it was time to really dive in. 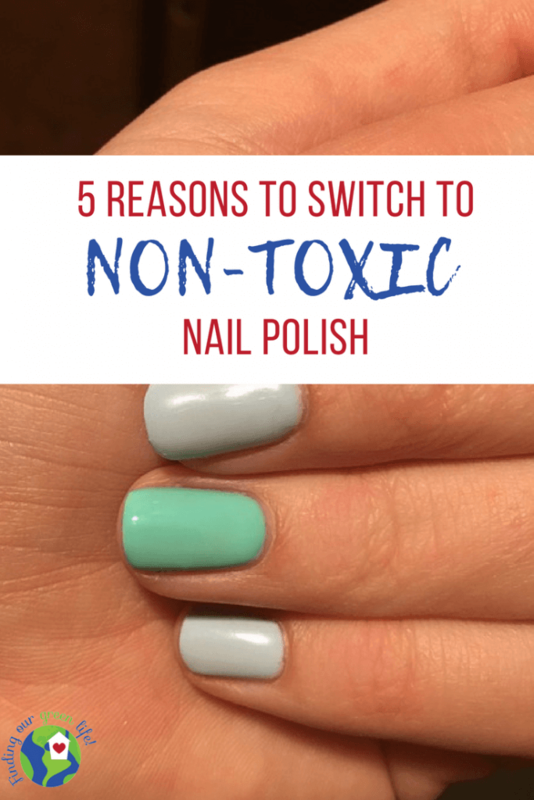 What’s the skinny on non-toxic nail polish? Let’s find out! You’ll see non-toxic nail polish labeled as 3 free, 5 free, 7 free and 9 free. The standard in the nail industry has become 3 free however, I like to err on the side of caution when it comes to all these chemicals. These ingredients are used in nail polish to preserve, harden, keep flexible and minimize chipping. Formaldehyde is a known carcinogen that also can cause moderate to severe respiratory problems like coughing, wheezing, bronchitis, eye irritation, and nasal and throat cavity irritation. Prolonged use can result in skin sensitization which can result in an increased risk of cancer. Dibutyl Phthalate is classified by the EU (European Union) as an endocrine disruptor as evidence shows it interferes with hormone function. Evidence also shows it may cause harm to an unborn child. Toluene irritates the respiratory system as well as the central nervous system. It can cause dizziness, fatigue, lightheadedness, headache, memory loss, nausea, coughing, and wheezing among other things. Probably the most concerning side effect is it can cause reproductive harm. Camphor is used in nail polish to give it a shiny, glossy finish. Camphor can cause dizziness, nausea, headaches, skin irritation, and liver dysfunction. Formaldehyde Resin is used in nail polish to form a durable film that improves durability while also maintaining a high gloss finish. Formaldehyde Resin is a byproduct of formaldehyde that can cause skin irritation and allergies. 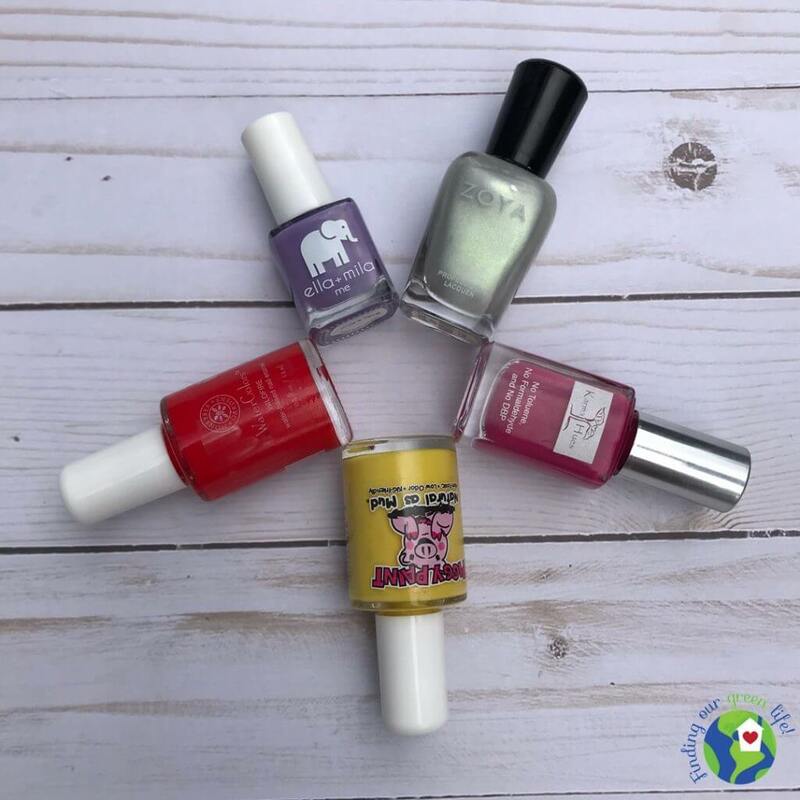 How Does Non-Toxic Nail Polish Hold Up? *Ella+Mila is 7-free as well as cruelty-free, vegan and made in the USA. You can choose from a wide variety of colors and surprisingly, two bottle sizes which I did not realize when I purchased it. The “me” collection is a 7ml bottle size while the other collections are a 13.3ml bottle. The website claims the nail polish drys quick and is chip resistant. I found both of these claims to be true. I applied two coats and it looks great. *Honeybee Gardens is free from harsh chemicals (per their website), vegan, gluten free and is pretty much odorless. I can attest to that, I was surprised that it actually has hardly any smell. Such a welcome relief. There are 23+ colors to choose from. I chose this fun orangy/red color. It is water-based, not sure if that’s why it didin’t last as long on my nail. *Karma Hues is 4-free as well as cruelty-free, vegan, made in the USA and the bottles is 100% recyclable. You can choose from over 100 colors, including matte and glossy. The website claims the nail polish is durable and chip resistant. I found this to be mostly true. It did begin to chip after some heavy dish washing but nothing that wasn’t easily touched up. I applied two coats and it looks great. *Zoya is 5-free and comes in a gazillion colors. Their website does not indicate if they are cruelty-free or vegan although, several other environmental websites state that they are cruelty-free. Zoya was one of the first to start kicking the harsh chemicals out of nail polish and has been a favorite of mine for years. I applied two coats and it looks great. It did begin to wear away after 4ish days but could easily be touched up. 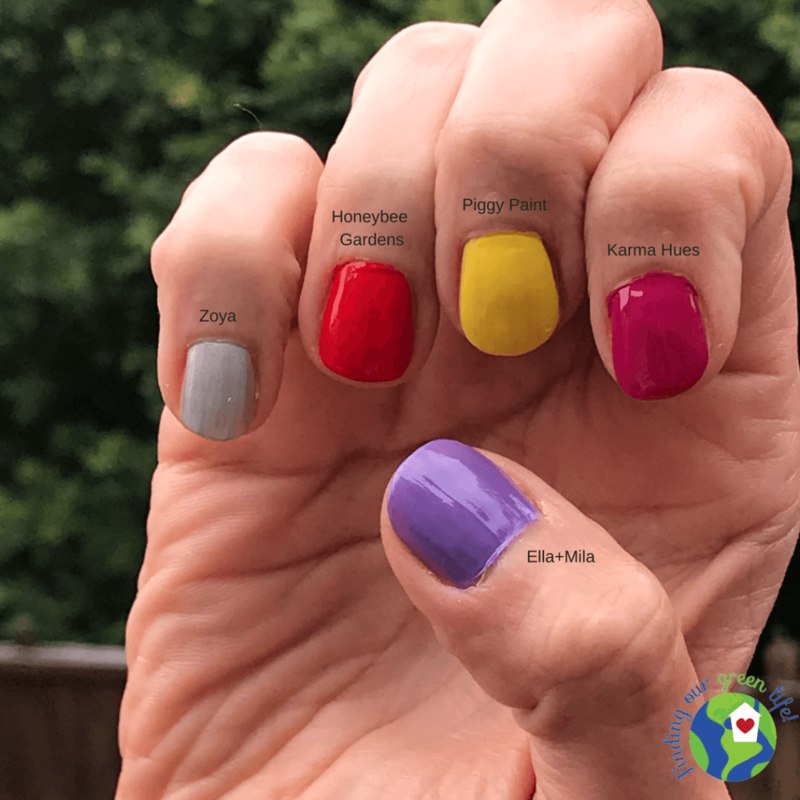 *Piggy Paint is 7-free, cruelty-free, vegan and another that is pretty much odorless and waterbased. As the name would indicate, it’s geared towards kids so I chose a fun yellow color to try out. Young kids don’t seem to keep nail polish on for any length of time so the fact that this started chipping within a day wasn’t a problem. The first few times we tried nail polish on my daughter, she was probably about 5 and wanted it off no sooner than it had dried. I painted my nails one afternoon and after having a shower, the Piggy Paint had already started coming off. After preparing and cleaning up from dinner, the Honeybee Gardens started chipping. I noticed a small chip in the Karma Hues polish the next day. 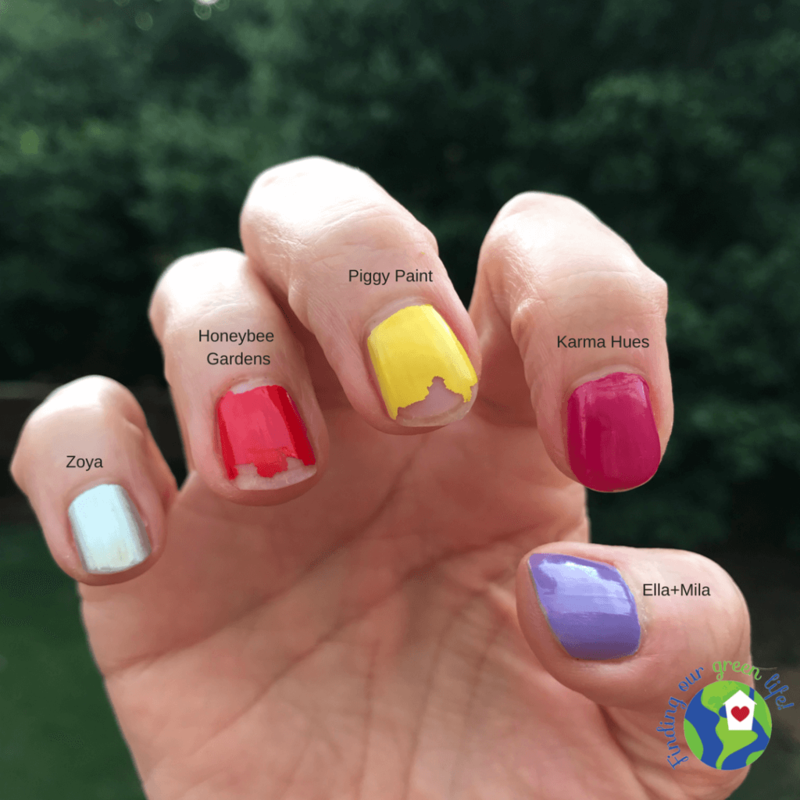 Over the next few days, both the Piggy Paint and the Honeybee Gardens polishes continued to come off, the others remained intact. I left the polish on for 5 days before finally getting around to removing it. The Ella+Mila, Karma Hues and the Zoya only had just started to come off around the nail edges. I wouldn’t even call it chipped. For me, a week is definitely long enough for a nail polish to hold up. During the week, I did all the normal day-to-day things, showered, washed my hands, did dishes, etc. so the nail polish held up quite well. I didn’t test out different non-toxic nail polish removers. I use *Mineral Fusion and love it. It’s acetone free and has a pleasant scent. I can buy it online or at Sprouts, Whole Foods or possibly Earth Fare (I haven’t checked). Interestingly, the Piggy Paint and the Honeybee Gardens polishes are water based but were the hardest to remove. After doing a little digging, I discovered that to remove water-based nail polish, it’s best to use a non-chemical solvent and let it sit on the polish a few minutes before removing. Just a little tip if you go that route. Yes, this is true. 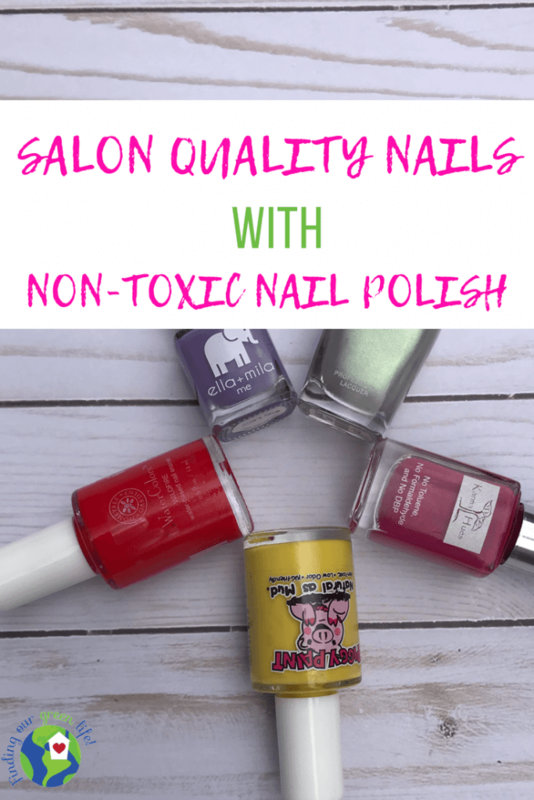 I don’t know that it’s entirely possible to have a 100% chemical free nail polish (I mean water is a chemical but not one that I’m concerned with) but it is super easy to have salon quality nails without all the harsh chemicals. You may remember a previous post I wrote about how to find your green lifestyle without losing your mind, it only took me about 40ish years to figure out life is not an all or nothing game. I like to have pretty toes during flip-flop season but outside of that, it’s not high on my priority list. You can read more about my safer choices for other personal care products here. There has to be a balance in life. Lord knows having kids will teach you that. My daughter wants all the things she sees in the gabillion YouTube videos she watches and all the things her friends have but my mommy conscious isn’t comfortable with all that. I do take her to the nail salon a couple times a year to get her nails painted but at home, we’ll stick to the non-toxic nail polish for our nails and the non-toxic personal care products for all the other girly things we’re doing on any given day. Aren’t we all just doing the best we can with the knowledge we have. Awesome! I’d love to hear how you like them.